When you need someone to effectively service the computers at your office and you don’t want them to cause disruption in your office while doing so, Solutions Unlimited’s on-site computer repair solutions in Indiana and Florida may be right for you. Instead of forcing you to disconnect your computer and bring it to our location for services that may take upwards of a week, we come to you and solve all of your computer issues. 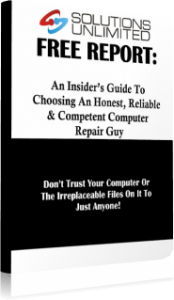 With our easy and affordable on-site computer repair services in Indiana and Florida, you can expect the best out of your PC network. Call us today to see how we can help you.